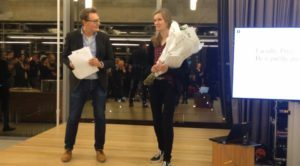 IViR is very proud to announce that Kelly Breemen was awarded the first prize in the annual Prize for Best Publication of the Academic Year 2017-2018 for Young Researchers competition for her paper ‘Protecting traditional cultural expressions – copyright tensions and human rights opportunities?’ at the Law Faculty’s New Year’s Reception on 10 January 2019. The paper is published as a chapter in Critical Indigenous Rights Studies (edited by G. Corradi, K. de Feyter, E. Desmet and K. Vanhees, Routledge 2018). The selection criteria applied by the jury were originality, academic rigour, the extent to which the publication transcends borders and is interdisciplinary, and its relevance to a European and international audienceAccording to the jury, the paper is “very well written, clearly structured, innovative and very thorough. It emphasizes some functional limitations of the human rights regime, while simultaneously arguing convincingly for the importance of that same human rights regime.” The other papers in the top three were written by Brito Bastos (CSECL) and Svetlana Yakovleva (ACIL).